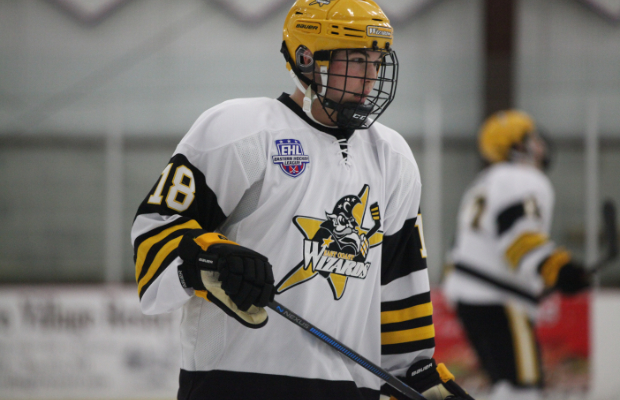 BEDFORD, MA -- The East Coast Wizards jumped out in front and never looked back on their way to a 7-1 victory over the New York Applecore. In total, the Wizards had 7 different goal scorers and 13 skaters tally at least a point, as they extended their winning streak up to 4 games. For the season, the Wizards are now 8-3-1, and find themselves at the top of the South Division in the New England Conference. "Our guys played well in all phases last night," said Wizards head coach and general manager Freddy Meyer. "We are getting better each week, but we also know that there are still many challenges coming up on our schedule. It's important for us to stay focused, and not let the recent success get to our heads." The opening 20 minutes featured some pretty good back and forth action, with chances for both teams. With just under 4 minutes left to go in the frame, Patrick Rossetti beat Alexander Fowler to give the Wizards the 1-0 lead heading into the break. The shots after the 1st period pointed in favor of the Wizards, 8-7. The late goal from Rossetti sent the Wizards on their way, as they added 3 more goals up on the board in the 2nd period. Isaac Leslie and Trent Pitser each scored on the power-play, while Herman Lundback added an even strength goal, extending the lead up to 4-0. The middle frame was all Wizards, as they outshot the Applecore 23-6. Things didn't change much in the final frame, as Noah Furman, Gabriel Gagnon, and Tim Usalis each found the back of the net for the Wizards. Logan Scarlotta was able to keep New York from getting shutout, but the 1 goal was all they would get in this one. The 3rd period shots were a little closer, pointing 16-11 in favor of the Wizards, and between the pipes, Kevin Dacey played well on the way to his 3rd win of the season. The Wizards hit the road for a big 3-game set in Philadelphia. They will look to keep the streak going when they take on Little Flyers on Thursday, and then battle the Revolution on Friday and Saturday. Isaac Leslie ('98) helped pace the offense on Saturday night, tallying a goal and 3 assists to his name.